Trying to name the best of Patagonia for a short trip to that southernmost region in Argentina isn’t an easy task. The region covers a great expanse – nearly 2,300 miles north to south — with a diverse climate that takes you from sea level to Fitz Roy’s soaring 11,020-feet peak. Do you seek glaciers? Mountain treks? Perhaps steppe-like plateaus? Wildlife? Do you want to trek to beautiful high alpine lakes, watch flamingos settle into low-lying lakes, walk to cave dwellings with petroglyphs and pictographs, enjoy a glacier trek, or seek out petrified trees and dinosaur bones? Yup. The Santa Cruz region of Patagonia, as the second largest province in Argentina behind Buenos Aires, may be what you are after for discovering some of the best of Patagonia. It has all of that … and more. 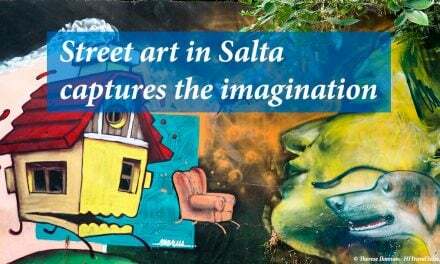 The Santa Cruz Province is not so difficult to get to – flights come in frequently to the El Calafate airport opened in 2000 – and there are regular buses both to the town of El Calafate as well as to the town of El Chaltén to the northwest, considered the National Capital of Trekking. There are hotels, restaurants, shops and services in both small towns – sometimes rustic, to be sure, but “quaint” to quite lovely – and each town is growing dramatically (Note: So you better get there soon before they are overrun! Once the El Calafate airport was opened, the population there went from about 3,000 to 25,000!). From these two base camps you can choose your day’s activities based on the weather – which can of course be quite changeable, especially during shoulder seasons. 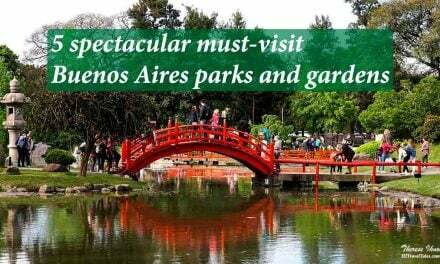 However, the biggest draws in the area – trekking or backpacking with a guide, trekking on the famous Perito Moreno Glacier, or getting into the Petrified forest between El Calafate and El Chaltén – all take advance booking. 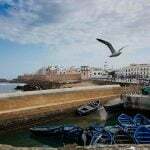 Spaces are limited and popularity high, especially during the higher summer season of December to February. Remember, Patagonia is not only known for its endless wind, but also its fickle weather. So be prepared! Check here to see the weather currently in EL Chaltén and around. 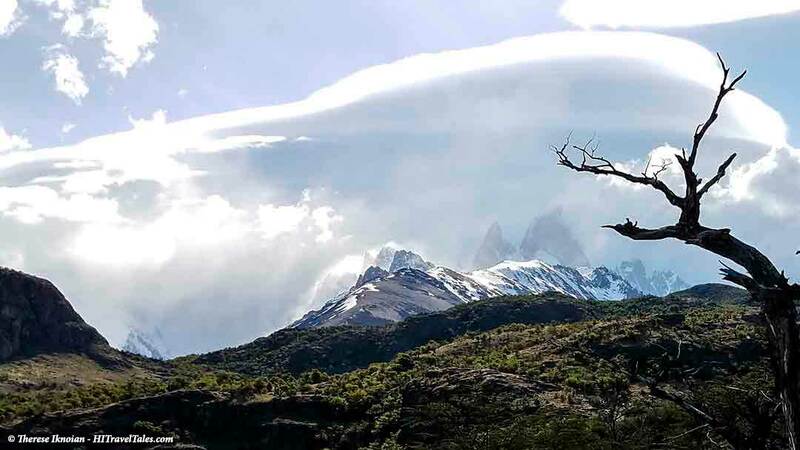 From a hiking trail near El Chaltén, Fitz Roy tries to peek out of the cloud formations. 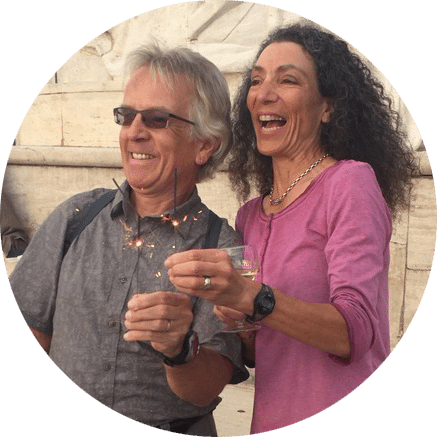 HITT Tip: Taylor of Walk Patagonia says the average price for a private day tour with your own guide could be about USD $250, but that would of course depend on what you do, how many days, and if you join a group or how large it is, and other factors. With any operator, they will manage all the details you desire – from bus transportation, to some entrance fees, to lunches and booking hotels – so you can enjoy seeing the best of Patagonia. Walk Patagonia knows the area well and, as a small family-run business, offers friendly, personal services that I enjoyed immensely. One can find a list of tour operators on the El Chaltén tourism website and the El Calafate website. During our six-day trip to see some of the best of Southern Patagonia in the Santa Cruz Province, we spent two nights in El Calafate, two nights in El Chaltén, and two days/one night backpacking through some of the most incredible and diverse scenery in the Las Glaciares National Park (Parque National Los Glaciares), basing out of Walk Patagonia’s pre-set-up group campsite (no arguing with a tent or cooking yourself!). Read on to find out about some of the best of Argentina’s Southern Patagonia — with recommendations, tips, links and advice — to help you plan your next trip. El Calafate is more developed with a broader range of services than other smaller towns or villages. However, at 210 kilometers (about 130 miles) from El Chaltén, a day trip to El Chaltén would in my opinion be a bit nuts (with the roads and weather, count on up to three hours, one way). So either you split your time between the two, or choose one or the other if your time is limited. Glaciarium Interpretative Center. Funded by private investors whose goal is to educate people about glaciers and their fragility, the Glaciarium is one fantastic private museum just outside of town (6k, or 3.75 miles). It serves as an excellent introduction to the science and history of glaciers, their exploration and history, and the climate’s affect on them. Interactive exhibits, movies and maps help it come alive for all ages. There is an hourly free shuttle from town, but check on opening and shuttle hours during the winter season. A superb way to start your trip. 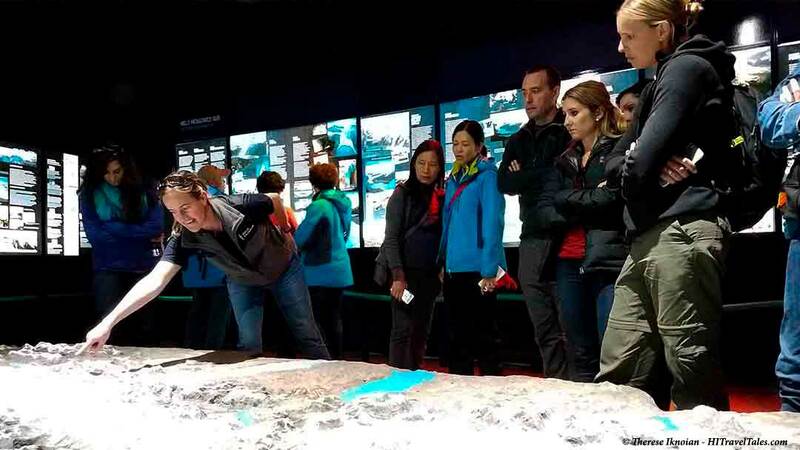 Zoe Taylor of Walk Patagonia points out the mountains and glaciers on a 3D map at the Glaciarium. Perito Moreno Glacier and Pasarelas Perito Moreno. Located in the Los Glaciares National Park, this for many is perhaps the highlight of coming to Patagonia – seeing and perhaps trekking on the grand Perito Moreno glacier (see photo at the end of the story). It is an expansive and spectacular sight with continuous and dynamic changes that keep it live. In fact, it is one of the few glaciers in the world that is actually still advancing. Words cannot describe its size and grandeur at 98 square miles and 3 miles wide at its terminus, which averages 240 feet above water level. You can sit for hours and watch the clouds and light change, and experience the thunder of “ice calving” when great slabs the size of tall buildings break off the front and explode into the water below. After a visit to the glacier, which can be organized by a tour operator or directly through the exclusive contractor for the park, Hielo & Aventura, take the time to visit the walkways (“Pasarelas”) opposite the glacier for a different kind of view. 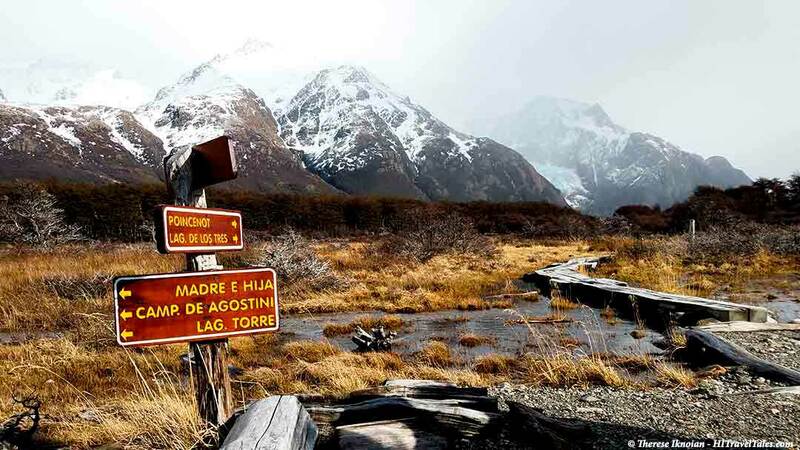 HITT Tip: Of course, one can see the glacier from the “Pasarelas” or walkways across from its terminus, and the sight is glorious – and free, as you often see pointed out on online travel forums. 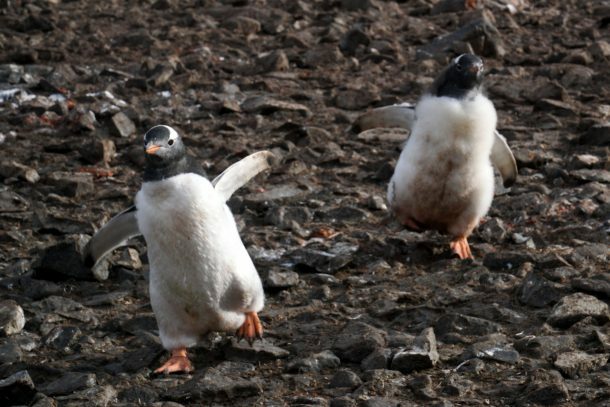 Although trekking up and on the glacier is not an inexpensive treat (USD $137 to $354, depending on various choices), it is a totally different experience that is worth every penny (not to mention the whiskey and chocolate you get at the end). Choose either the “Mini-Trek” of about 1.5 hours on the glacier itself, or the “Big Ice,” a more strenuous trek with about 3.5 hours on the glacier. Please note age limitations. Argentina Lake and Reserva Laguna Nimez. The lake, as the largest freshwater lake in Argentina, is truly a dominant feature, spanning 20 miles at its widest. At certain times of day, you will also find flamingos at its edges, depending on tides. Other birds and wildlife abound. Walking alongside the lake is free, but if you want to get into the ecological reserve of Laguna Nimez, you will need to pay a small fee. This gives you closer access to birds and vegetation on an interpretative trail. 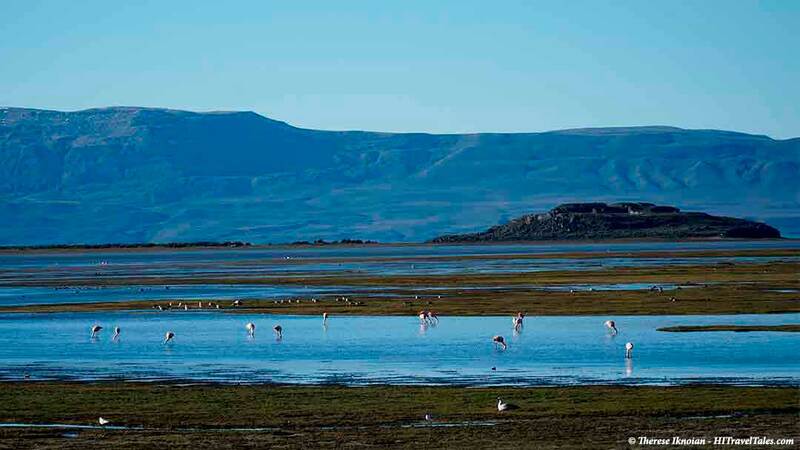 Flamingos dot the Reserva Laguna Nimez at the edge of Lake Argentina. Cave dwellings and pictographs. One of a few surprise sights in Patagonia but not to be missed. Called Punta Walichu, the area is on private property just outside of El Calafate overlooking the lake, and is not accessible without a tour, which Walk Patagonia arranged. 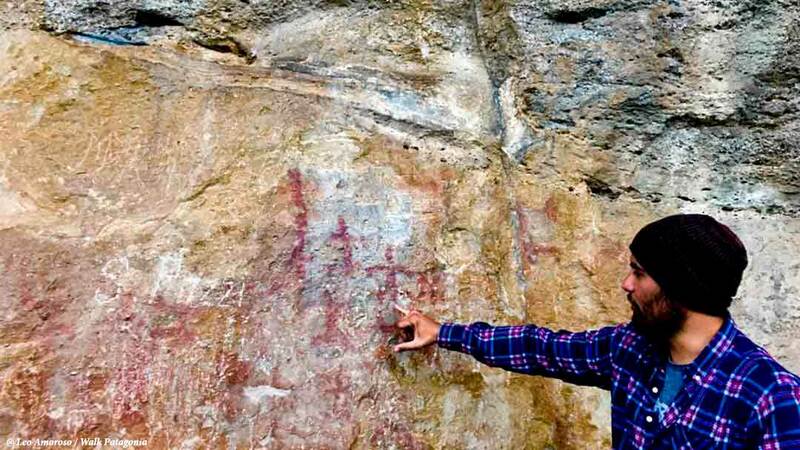 The so-called “Nativo Experience” consists of a visit to a series of caves and rocks with paintings, pictographs and petroglyphs. Certainly among some of the best in Southern Patagonia, your tour will include an archeological guide and either lunch or dinner. We enjoyed an evening stroll and a candle-lit cave dinner. The tour also supplies warmly lined ponchos for extra protection since it is a windy spot. But the cave is toasty warm, the stew yummy, and the Argentinian red wine a perfect match! A guide for the Nativo Experience describes some pictographs on the rock walls. 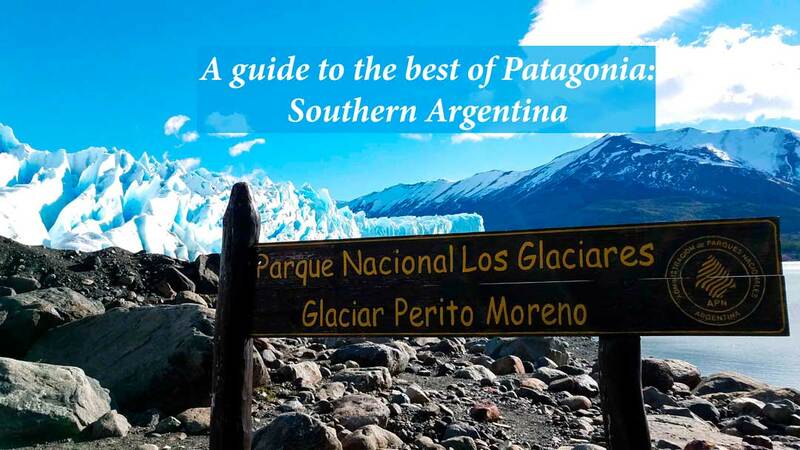 HITT Tip: Finding information online about the best of Southern Patagonia in Argentina is not the easiest. Many private tour companies have URLs that look to be official agencies. El Calafate.tur.ar is indeed the official site of the ministry of tourism, and a plus on that site is that the information is relatively well organized and in various languages. Restaurants. The town is filled with them. We enjoyed a “parrilla” or barbeque at the spectacular La Tablita, just across the bridge (if you keep going from the park mentioned above), and you can always finish up with a “Calafate” ice cream (made from the local berries) or house-made chocolates at Ovejitas de la Patagonia (in the center of town on main street). Other places recommended by locals: cosy and casual Pura Vida, a higher-end bistro called Casimiro Biguá. If you want just want to enjoy a local brew, try out La Zorra. 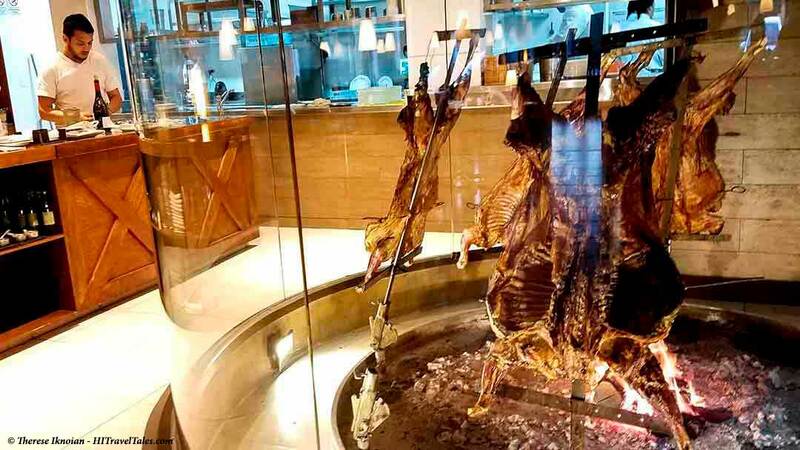 Meat grills in a traditional style at La Tablita Parrilla. Hotels. I stayed at the Kosten Aike and thoroughly enjoyed the ambiance, hospitality and breakfast, not to mention being so close to town! Others to consider include the El Quijote, the Calafate Parque, and the Kau Yatun (slightly on the edge of town with a ranch-like feel). 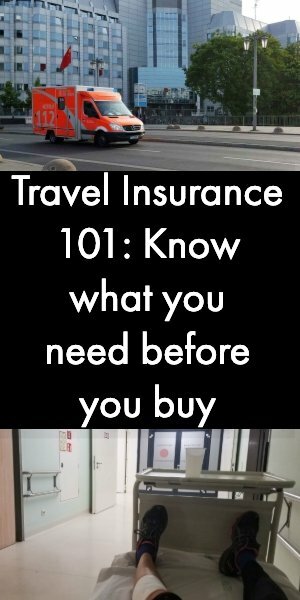 Or check the local town and tourist websites or Booking.com for other price ranges. 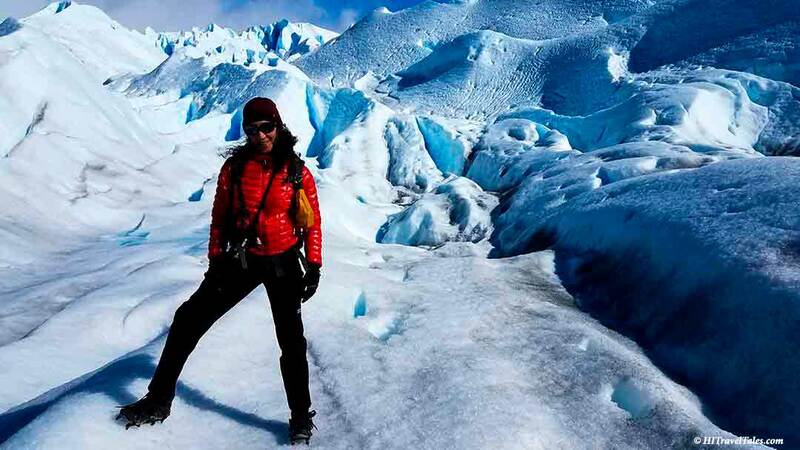 HITT Tip: The El Calafate Tourist Office is located just off the main street on Cnel. Rosales 1-98, hear La Tablita restaurant. Other information centers are listed here. La Leona Roadhouse. This is just what the name says: a rustic roadhouse halfway between El Calafate and El Chaltén, where nearly everybody stops – well anybody who wants a coffee, snack or bathroom. It is near Viedma Lake, which is fed by Viedma Glacier. There are also four hotel rooms, a small “museum” of a few local artifacts (if a closet-sized room counts as a museum), a dining room, and a gift shop. Of course. And wind. Of course. La Leona is a super cute stop for a leg stretch. And you can try your hand at the ring toss game tacked to the wall. We were bummed to not be able to taste the “famous” lemon meringue pie, which hadn’t been made that day! 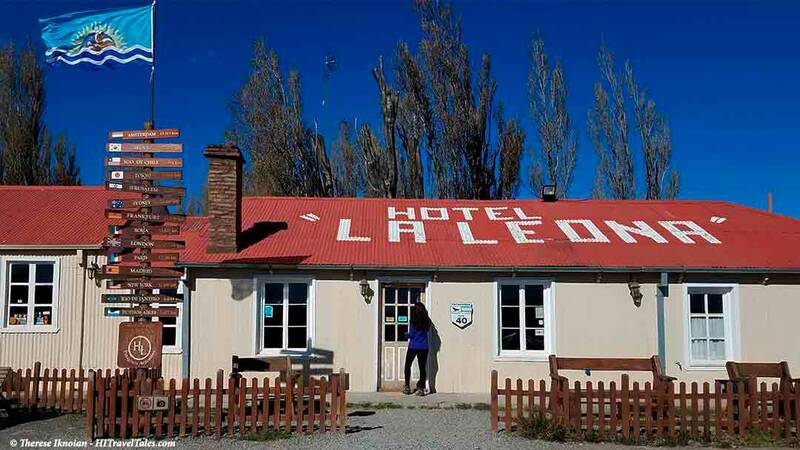 Simple and rustic, La Leona Roadhouse is a must-stop between El Calafate and El Chaltén. Winds keep flags at attention. Petrified Forest. 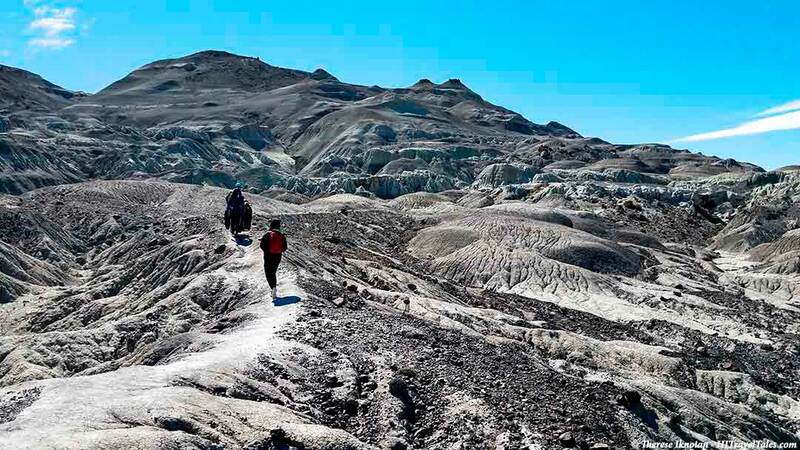 Who knew one can explore a petrified forest in Patagonia? This site is not marked because it is on private land and only a limited number of permitted small group tours are allowed in. You will walk several miles through an expanse of nearly desert-like terrain a few miles from La Leona, where you will see dinosaur bones and petrified trees. Our guide told us archeologists think there are a lot of unfound bones, trees and materials but there is no support for the cost of further exploration. If you want to go, book a tour through one of the approved operators, such as Walk Patagonia. Hiking through the eerie, fascinating world of the Petrified Forest. El Chaltén is more of a village than a city or even a town. As the newest village in Argentina, it was established in 1985 to secure the disputed border with Chile and, although pretty tiny, it and the surrounding area is indeed some of the best to visit in Southern Patagonia. 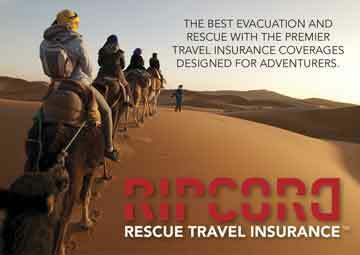 Today, it survives on adventure travel and mountain tourism. With a permanent population of not much more than 1,700 (up from about 41 in 1991!). 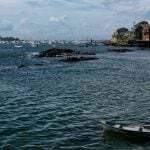 That number can swell enormously during the tourist season, considering the number of various types of accommodations in the area. Trekking, hiking, walking and climbing. These are the reasons most people end up in El Chaltén, considered the National Capital of Trekking, and no wonder: The choices are nearly endless, the scenery of glaciers and mountains and lakes ever changing, and the levels of difficulty vary enough to accommodate most everybody. Check out some of the possible self-guided treks in the area here. You can hire guides for any of these or others, as your comfort levels allows. Even when weather isn’t ideal, hiking allows you to enjoy the beauty of best of the Southern Patagonia mountains. The town of El Chaltén. Take a stroll around town. 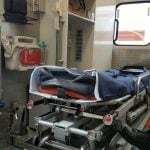 Won’t take long. You’ll see mostly services geared toward those hiking or climbing – or waiting out weather to hike or climb. Restaurants, tour operator offices, gear and grocery stories, hotels, and the like. Looking for some local goodies to take home? Stop in at Chalteños (Avenida San Martin 249) get a coffee to go while you check out homemade jams and other sweets, including marmalades from the Calafate berry! Restaurants. Our group tried out La Cerveceria (Av San Martin 564), which was the first microbrewery in the small town, brewing pilsners and bocks based on the German Purity Law and a family recipe from 1673. Owner Manuela says proudly that her mother was “Resident No. 99” of El Chaltén. Between 2014 and 2017, she says, seven other microbreweries opened in this little burg. Guess those waiting to hike or climb like their beer…. An obviously popular place with the locals and serving pizzas, pastas and other pub fare is La Tapera (Avenida Antonio Rojo 75). Remember, as with most Argentinian restaurants, getting a meal before 8 p.m. can be difficult. Today, La Cerveceria is one of a number of microbreweries in El Chaltén, although it was the first. Hotels. 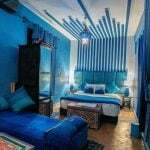 There is any number of places to stay that will fit any budget. Considering many come to backpack and climb, there are a lot of accommodations on the simpler side. I tried the Lunajuim, called a 3-star hotel, where rooms are very simple, while the entry and lounge are quite comfortable. I also had the luck to also try the newer Chaltén Suites, definitely one of the higher-end hotels in town, with large rooms and beautiful baths. Author Therese Iknoian (that’s me!) found the trek on the Perito Moreno Glacier utterly fascinating. Southern Patagonia in Argentina’s Santa Cruz Province offers some of the best you can find in the area with its diversity. 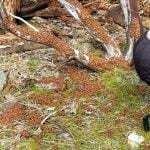 In the map below, pins mark the exact location of the sites and places to see mentioned in our articles and travel tips on Southern Patagonia. Zoom in or out on the map using the controls. Switch easily from map to satellite view. Click on each pin to pull up a tooltip with the name of the destination or location as well as any additional information, including links to stories and articles. This map is the perfect place to begin planning what to do in Southern Patagonia for one, two, three or more days. La Leona Roadhouse. 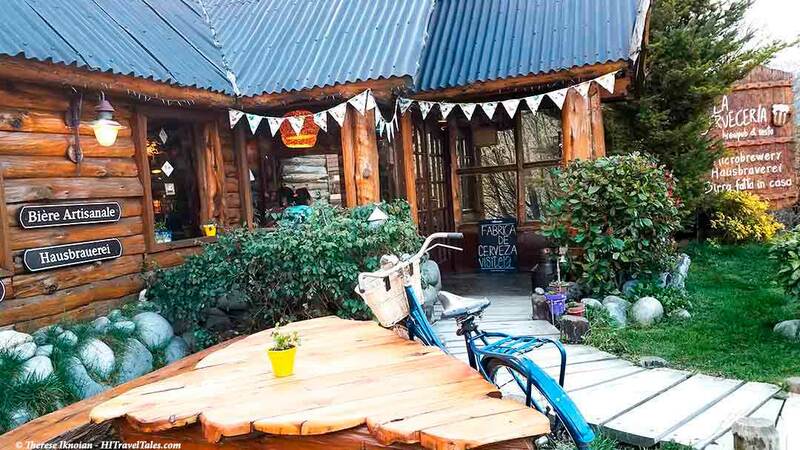 This is just what the name says: a rustic roadhouse halfway between El Calafate and El Chaltén, where nearly everybody stops – well anybody who wants a coffee, snack or bathroom. 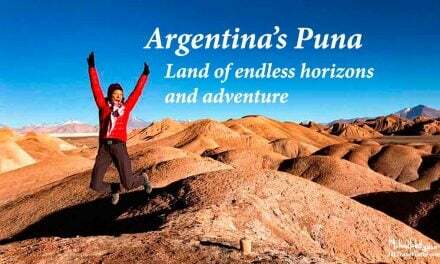 Who knew one can explore a petrified forest in Patagonia? This site is not marked because it is on private land and only a limited number of permitted small group tours are allowed in. One of a few surprise sights in Patagonia but not to be missed. 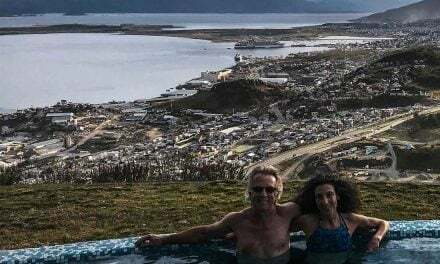 Called Punta Walichu, the area is on private property just outside of El Calafate overlooking the lake, and is not accessible without a tour, which Walk Patagonia arranged. The lake, as the largest freshwater lake in Argentina, is truly a dominant feature, spanning 20 miles at its widest. At certain times of day, you will also find flamingos at its edges, depending on tides. Located in the Los Glaciares National Park, this for many is perhaps the highlight of coming to Patagonia – seeing and perhaps trekking on the grand Perito Moreno glacier. Funded by private investors whose goal is to educate people about glaciers and their fragility, the Glaciarium is one fantastic private museum just outside of town (6k, or 3.75 miles). It serves as an excellent introduction to the science and history of glaciers, their exploration and history, and the climate’s affect on them. La Cerveceria was the first microbrewery in the El Chalten, brewing pilsners and bocks based on the German Purity Law and a family recipe from 1673. I also had the luck to also try the newer Chaltén Suites, definitely one of the higher-end hotels in town, with large rooms and beautiful baths. Heads up! This information on the best of Patagonia, Southern Argentina was accurate when we published it on HI Travel Tales, but, as we know, traveling is all about changes (and inflation, sadly). Please be sure to confirm prices, transportation schedules, hours of operation, safety and health considerations, request for perfect weather during your entire visit, and any other important details before your adventure.